Gerrick “Tony” Sheldon confers with his attorney, Jeff Ratliff, Friday in Hardin County Common Pleas Court during his trial on charges of complicity to attempted aggravated murder. Sheldon is alleged to have orchestrated a scheme to have his ex-wife’s house burned to the ground in August of last year. 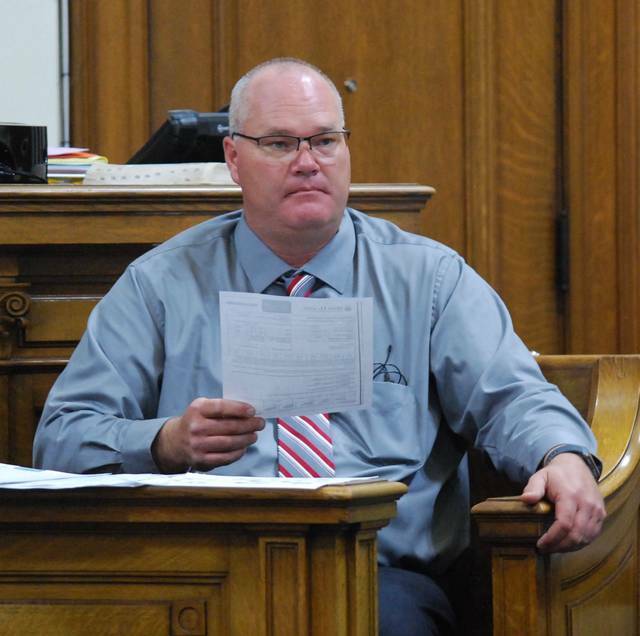 Detective Michael Conley of the Hardin County Sheriff’s Office spent a second day on the witness stand Friday in the trial of Gerrick Sheldon. 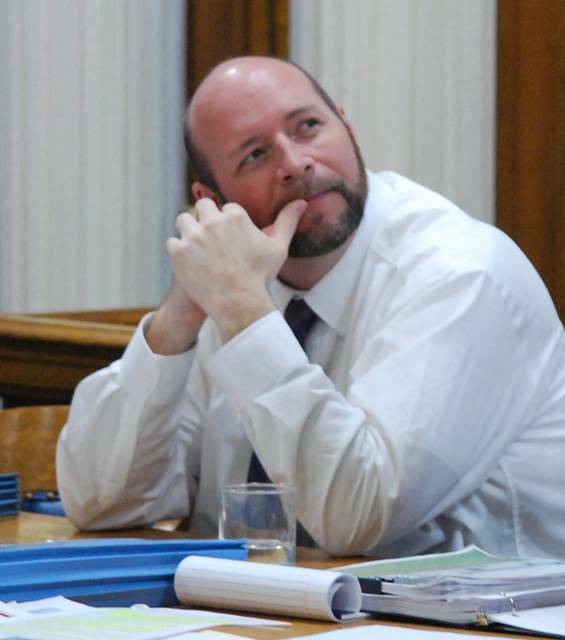 KENTON — Attorneys for Gerrick “Tony” Sheldon attempted to paint for jurors a picture of shoddy or incomplete police work Friday as the Harrod man’s trial entered its fifth day. Sheldon is charged with complicity to attempted aggravated murder and other charges related to his alleged attempt to have another person burn down the house of his estranged wife in August of last year. Prosecutors allege Sheldon concocted a plan to have gasoline poured into a dryer vent and ignited at the home of Danielle Sheldon, from whom he was separated at the time and is now divorced. He allegedly enlisted the aid of his 16-year-old son, Garrett, to carry out the plan in the early morning hours of Aug. 13, 2017. The teenager testified early in the trial that his father had prepared and assembled a bag containing a gallon jug of fuel, a lighter, a funnel with a length of hose taped to it and some wadded-up newspaper and that he — Garrett Sheldon — had carried the kit to the rear of Danielle Sheldon’s house at 19312 County Road 60, Dunkirk, that night. Those supplies were found at the scene by investigators. 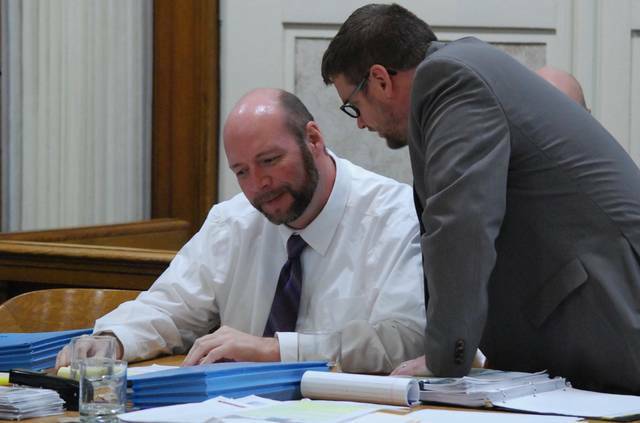 With Detective Mike Conley of the Harrod County Sheriff’s Office on the witness stand for a second straight day, defense attorney Rocky Ratliff questioned the detective’s decision to send only a limited amount of physical evidence to the Ohio Bureau of Criminal Investigation for DNA analysis. Ratliff was also critical of Conley for failing to follow up with additional interviews of key players as the case continued to unfold. The defense attorney attempted to point out to jurors questions he believes should have been asked of persons who were interviewed. Ratliff left little doubt he was critical of the investigation as a whole. Jurors watched for a second time a taped interview Conley had conducted with Tony Sheldon on the morning of Aug. 13. Ratliff questioned why Tony Sheldon had not been asked during that interview about his knowledge of the jug of fuel, funnel and other items found in the bag that Garrett Sheldon allegedly had carried that evening to the rear of Danielle Sheldon’s home. Conley had no answer. The defense team also repeated assertions that Garrett Sheldon and his brothers, Trent and Hunter, were constantly in trouble with the law, struggle with mental health issues and have strained relationships with both their father and their stepmother. “Tony wants his wife back, Trent hates (Danielle’s) guts and Garrett wants to kill her,” said Ratliff, summarizing earlier trial testimony. Additional witnesses will be called to the stand beginning Monday morning.